Here’s a Japanese Kiridashi that I made as an experiment. Came from an old circular saw blade. I really like the kiridashi shapes, and this one is my “amazon opener”. It’s not really thick enough to get the proper single sided chisel grind of a true kiridashi, but it was fun to make. Carrying this in the UK in public would be regarded as a Very Bad Thing. Day to day I find a Leatherman Rebar jolly handy. Does it make for a good spring/fall jacket? Or does the 3.5oz flannel make for a sweaty experience? The interior flannel isn’t thick, so it makes the interior of the jacket soft and comfortable. I think it’s perfect for spring/fall and can be worn in winter if layered properly. Great minds think alike.... ;-) table saw blades are good steel. fixed blade i made when i had a free saturday a few years ago with my daily carry "money clip"
Nicely done on the saw blade! That look so like a Spyderco for your money clip. What model is it? It is an old Spyderco Delica serrated. It has been my money clip for over a decade. 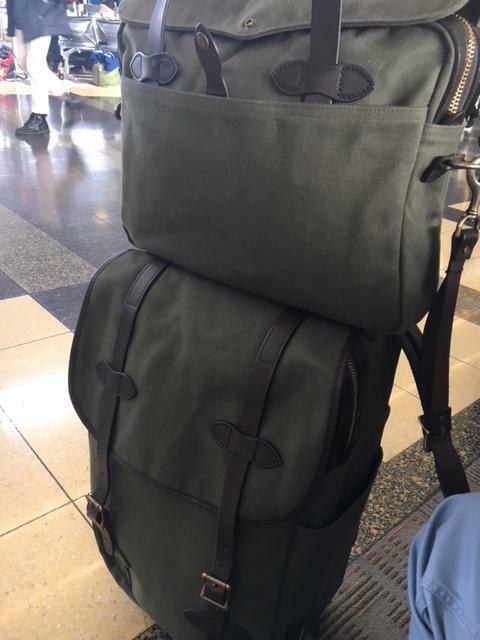 Staying on the topic of MiUSA I recently made a non-Filson purchase of my own that is both MiUSA and of very high quality and design. I bought it in person at Bass Pro Shop while in Atlantic City, NJ. For its size it also wasn’t cheap either, but with the right care, should last a lifetime, but in case it doesn’t, it has a lifetime warranty. I give you my first ever quality knife; The Buck 055 Lockback. It’s half the size of the world famous Buck 110 (hence why it’s called the 055), has brass bolsters/rivets and American Walnut handle. It’s the perfect size for my pocket too. Just wanted to share this with you guys. Oh man, that brought back memories. I bought my first and only Buck ranger in Kapuskasing, Ontario, Canada in 1987 for - I think - $68Cdn. I was working a reforestation project and we would go into town on the weekend and spend our hard earned bucks. This was one of the only things I have from that time. I still keep it in in my glove compartment. Only use it once a year usually - to cut the twine holding my Christmas tree to my roof rack. Small world, I spent a portion of two summers (90, 91) planting seedlings in northern ON (Hearst, Chapleau). If I develop a cancer or cognitive dysfunction down the road, I would attribute it to the inadvertent ingestion of DEET and any chemicals applied to the thousands of seedlings I planted. Beautiful! What’s your secret with international airplane travel? Something tells me you don’t carry on, unless you’re law enforcement. My sister who’s a detective with an FBI task force just flew with her glock on her hip and her partner was chewing tobacco during the flight . Not saying I support that last part, since I had nail clippers confiscated once.